This 5 Tips to Inspire Daily Confidence post was sponsored by Schick Hydro Silk® and Skintimate®. All thoughts and opinions are my own! A large part of confidence is self care. Confidence comes in many forms and taking care of yourself means buying the right products. 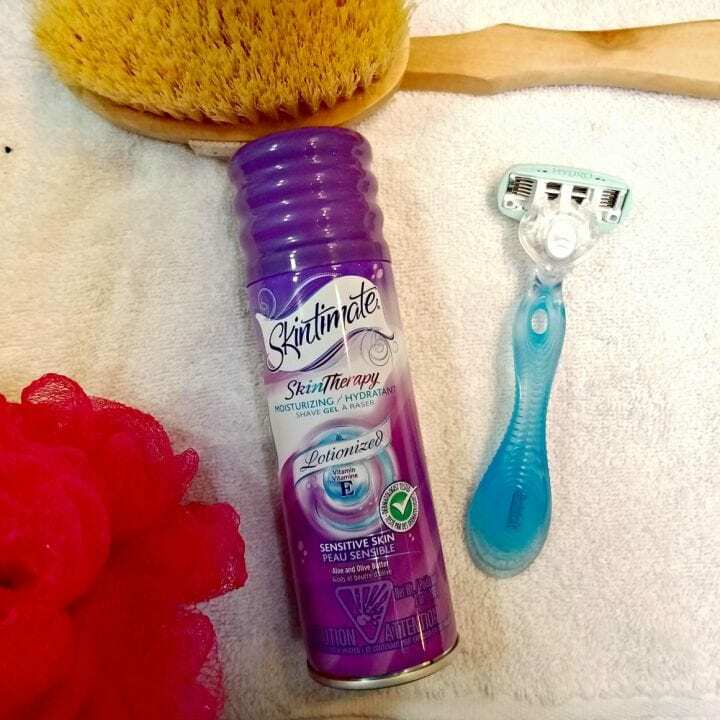 I know that I feel especially confident with silky smooth legs and my Schick Hydro Silk® and Skintimate® leg care routine gets me healthy-looking beautiful legs that feel as good as they look. The New Schick Hydro Silk® Razor moisturizes for up to 2 hours after shaving. This gives me the kind of confidence that I can rely on. 2. Visualize and practice positivity. Everything that I do, I do with positivity and enthusiasm. I always call myself an eternal optimist because I look at the world and see what is possible. I do the same thing with my children. If there is something we plan to do, we visualize it first and we also always stay positive by channeling our energy into something good. 3. Change your body language. Stand up straight and tall. Smile. Make eye contact. Just doing these simple things will instantly make you more confident. I always smile and look people right in the eye when I meet them and then carry on a conversation. I tend to focus outward as much as I can each day and a part of that is getting the exercise I need so I have more energy to tackle everything on my to-do list. Once I made exercise an important part of my life, I added it to my calendar like everything else because I make it a priority and it makes me feel great about myself. I cannot stress this tip enough. Have you ever tried to make dinner and you are missing one ingredient? It's frustrating isn't it? This is why people make shopping lists. I use lists for everything and I take pictures of my lists so they are on my phone as well. If I am getting ready for a big meeting, I prepare by writing myself out a list of everything that I know I will need for my meeting to be a success. My Schick® shave regimen is one of the ways that I become and stay confident each day. 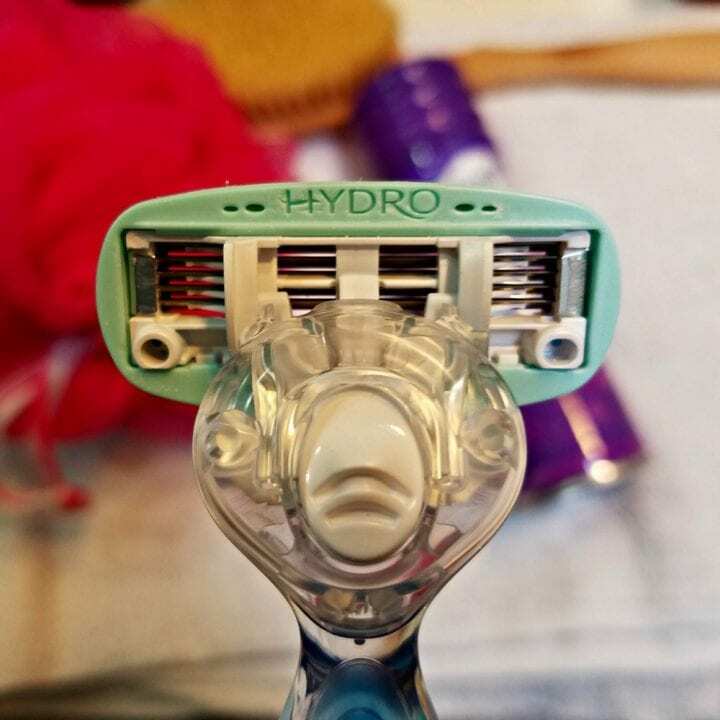 The Schick Hydro Silk® Razor leaves your legs smooth. The razor has a water-activated moisturizing serum that moisturizes for up to two hours after shaving. The five curve-sensing blades flex and the ergonomic aqueous soft touch razor handle offers a rubber grip for easy handling. My shave routine also includes Skintimate® Shave Gel. Skintimate® Shave Gel is formulated with nourishing moisturizers and vitamins that help replenish your skin's natural moisture. Simply lather up the gel and then spread over your skin for a nice, smooth shaving experience. 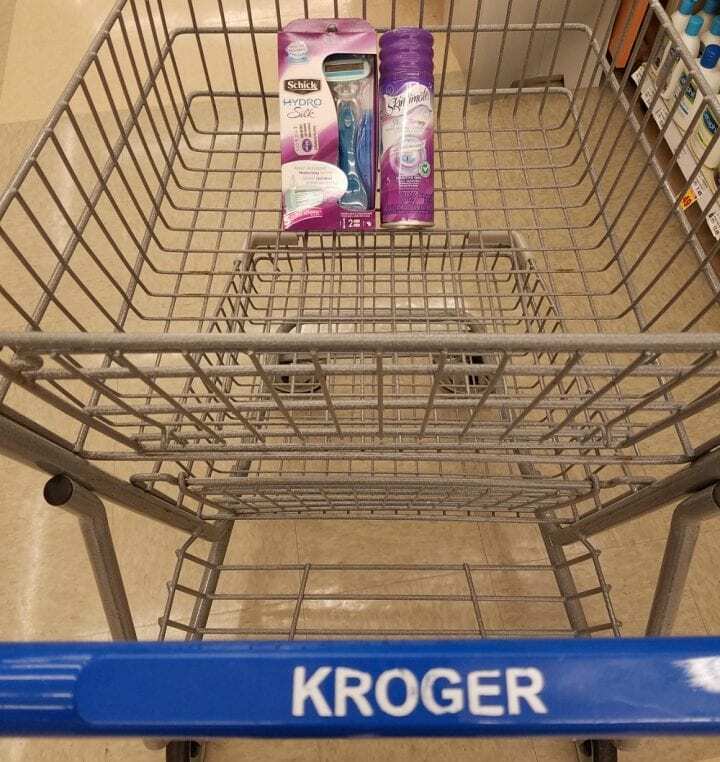 Now you can purchase both Schick® Hydro Silk Razors and Skintimate® Shave Gel at your local Kroger. 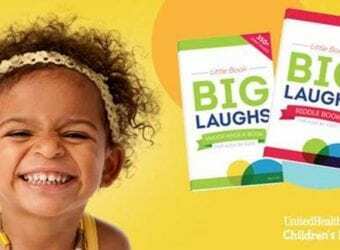 Grab your digital coupon savings at kroger.com. This 5 Tips to Inspire Daily Confidence post was sponsored by Schick Hydro Silk® and Skintimate®. I have been using Skintimate for YEARS! It is one of the few things I have found that doesn’t irritate my legs when I shave. Liked your tips and love your can do attitude. I will always exercise and try to prepare for any situation that can come up. I know this is for women, but I’m thinking this might be awesome on my face. I get really bad razor burn, and the razors I’ve tried for men aren’t cutting it. I like these ideas. It’s definitely important to make some changes if you’re confidence isn’t great. Little changes can make a big difference. I use Skintimate for shaving. It doesn’t irritate my legs and it gets really smooth! I think being prepared is the the top tip for feeling confident. When I have my stuff together, everything is good. Schick Hydro Silk® and Skintimate® looks like a good treatment – I am always looking for a different approach to treating my legs. I really like your list here – confidence is such an important trait to possess in dealing with our day-to-day world in general. I very much like this article and have bookmarked it for later review to share with my husband (he finds this trait tricky to achieve at times). Love these suggestions and I certainly agree! I always feel my best when I eat clean, drink plenty of water, exercise daily and make my personal care a priority. Confidence is everything! It affects how you carry yourself and how you think about yourself as well. It’s important that we learn to take good care of ourselves and make sure that we’re positive especially when it comes to our bodies! Having a positive attitude is definitely the key to having confidence every day. It’s not what happens it’s how you handle it and how you look at it. Taking care of yourself only makes sense. If I don’t feel well or am stressed everyone around feels it as well. No matter how stressed I am, or how toxic my day was, I always make it a point to care for myself. I only need an hour or two of alone time to relax and unwind, or else I would be chewing on everyone. haha. When I feel great about my self, that confidence rubs off on everyone else. It’s important to taking care yourself and drink a plenty of water to keep hydrated and have a beautiful skin plus a stay positve. I know when I have been to the gym, I feel so much better about myself. If you ask my husband, he sure does love it when my legs are nice and smooth. Excellent tips to live by! We have to take care of ourselves first and foremost so it makes sense that it is #1 on your list! These are great reminders. I am so glad I am back to exercising and have managed to lose a few pounds. That shave gel and razor combo are my fave and I have been using both brands for years!! Schick really is the best at getting a close shave and I love all the varieties of the shave gel!! Speaking positivity is soo important! It helps you gain confidence and feel better about yourself. #2 is my favorite tip. I come across so much negativity every day being exuded from people. Taking time every day to focus on being positive is so important to keep from being sucked into other people’s bad attitudes. Fake it til you make it. Practice confidence. That is so true. Do the warrior pose. These are all wonderful tips. I think exercise is always a great one. That’s a good step in to feeling really confident. Just think abd be positive when you start your day. Eat healthy breakfast and organize things you need. These are my great ways how to be confident in my daily basis. I am a firm believer of the Law of Attraction. Visualizing your thoughts and dreams enough can make them a reality! I feel more confident if I do things to improve my posture. I love to slouch but that does not help with my confidence. Learning to love my body has given me more peace of mind. I embrace my “me-ness.” and because I have hairy legs, I have to shave almost everyday to keep my legs smooth. I am currently using a different brand of razors and shaving cream but I would love to give Schick a try. These are good ideas, and they might not be much easier to change than losing extra weight, habits can be hard to break, but keep at it, sitting up straight, not thinking you are doing good by running yourself ragged, etc., and you’ll start to see a change! I love these 5 tips of yours. We should do all we can to encourage confidence and be proud of ourselves no matter what. I am over all a very confident person! I exercise daily and I love doing stuff for myself! I love all the tips you have here too! These are all great ideas to become even more confident! 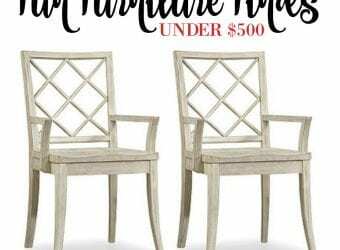 These are some fabulous tips. I need to work on exercise the most! These are all great tips. I try to schedule in exercise as much as I can. Keeping my body groomed and shaved is what helps me to be confident. I hate have fuzzy legs which limits what I can wear. Great advise. I lack in self confidence. I love how inspiring and encouraging you are with this post. Time to do something about it! These are such great tips! My favorite way to get confidence daily is to save digital copies of inspirational greeting cards that I have received in the past and go back and read the thoughts that my friends had about me. It always brings a smile to my face. I always feel more confident when I am dressed up a bit. I will have to pick up some Skintimate® Shave Gel to try. My legs have been so dry. I’ve always used Skintimate Shave Gel. Its the perfect addition to your shower routine and leaves you silky smooth. This has been my go to shaving regiment for many years! It’s summer and shorts season. Got to stock up on Schick. Your tips are a great reminder all year round, but with summer and a little bit more free time it’s a good time of year to focus on me. This is actually one of my favorite razors! I love the smoothness it leaves behind. With summer here, you gotta have smooth legs. I think positivist is the big one for me. With everything happening during the day it is often difficult to stay positive. Love your tips! These are really great tips! Having daily confidence and staying positive is not easy but it’s a great attitude to have! Thanks for your tips here! I go through razors like crazy since I always try to buy the generic brands that don’t last. I will have to try this one! Isn’t it funny that something as simple as shaving your legs can help you to feel better about yourself? but it does! It’s that idea that you are putting yourself first makes you feel so good but unfortunately we make ourselves feel so bad about it! It sounds like a good product and I love to have a good self-confidence and it’s important to take care yourself. I’ve been focused on the fitness part. I’ve been killing it this week. I’ve been crushing my step goals and it actually feels good. 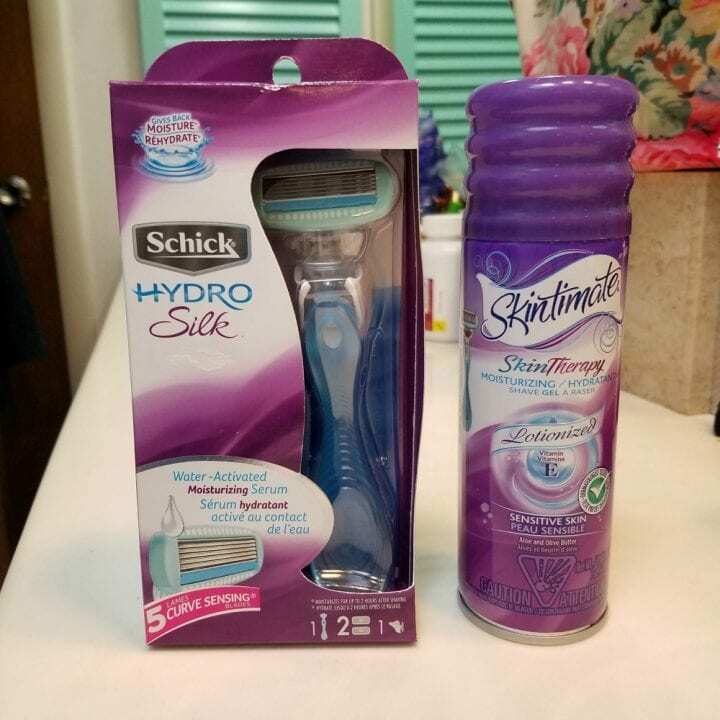 The Schick Hydro-Silk Razor and Skintimate Shave Gel are my go-to items when it comes to shaving. These are actually the exact items I purchase when I head to the store!